p> About the Wessex Stadium A well maintained tidy stadium that although a relatively new one (it was opened in 1987) is more reminiscent of an older ground. This is mostly due to the large traditional floodlights that are located in each corner. There is cover on all four sides of the stadium. 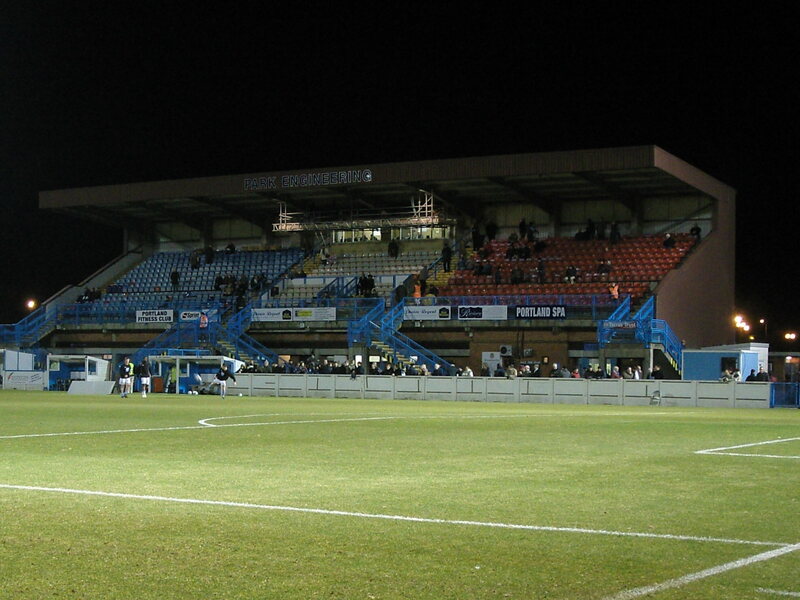 On the west side is the Main Stand, which is a covered seated stand that runs for around half the length of the pitch. The seating area of the stand is raised well above the level of the pitch, meaning that you need to climb a small staircase to access it. In front of the stand on either side of the halfway line are the team dugouts. Both ends are similar sized covered terraces, whilst on the remaining side of the ground there is also a small covered terrace. This area is called the AKI Stand and is affectionately nicknamed the Babs Windsor stand by the Weymouth fans (you’ll have to ask one to find out why!). The rest of the ground mostly comprises of portions of open terrace, to either side of the stands and in the corners. How to get to the Wessex Stadium The stadium is located a little way out of the town centre on the B3157 but is well signposted. There is a small car park at the ground which costs £2. There is a regular bus service that runs on a match day from Bus stop K2 which is on the seafront opposite the Cork and Bottle pub. Buses number 3 and 5 also run from close to the station to the stadium. A taxi from the town centre will cost £5. How to get a ticket for the Wessex Stadium Like nearly all teams at this level sell outs are unheard of at the Wessex Stadium. The biggest crowd ever at the stadium was for the visit of Nottingham Forest in the FA Cup in January 2005. The average attendance at the stadium over the past few seasons has been just under 1,500 so you will have no problems arriving on the day and getting a ticket. A place on the terrace costs £14 for Adults, and a variety of prices for concessions ranging from free for accompanied under 7’s to £10 for OAP’s. A place in the main stand is £16 or £11/£7 for concessions. The club also have a Premier Seat which for £22 also gets you a parking space, programme and access to the players lounge. More details can be obtained from the club on 01305 785558. Our Last Visit – Weymouth 0 Salisbury City 4 – 10th March 2009 I have a soft spot in football for any club that plays in Claret and Blue, and any team that is still trying in the face of aversity. In the past I have sported the colours of Scunthorpe United and Burnley, although I have drawn the line at Aston Villa. One of my favourite teams in Germany is Kaiserslautern thank’s to their claret and blue kit and the constant struggle as one of the Bundesliga’s perrenial under achievers. 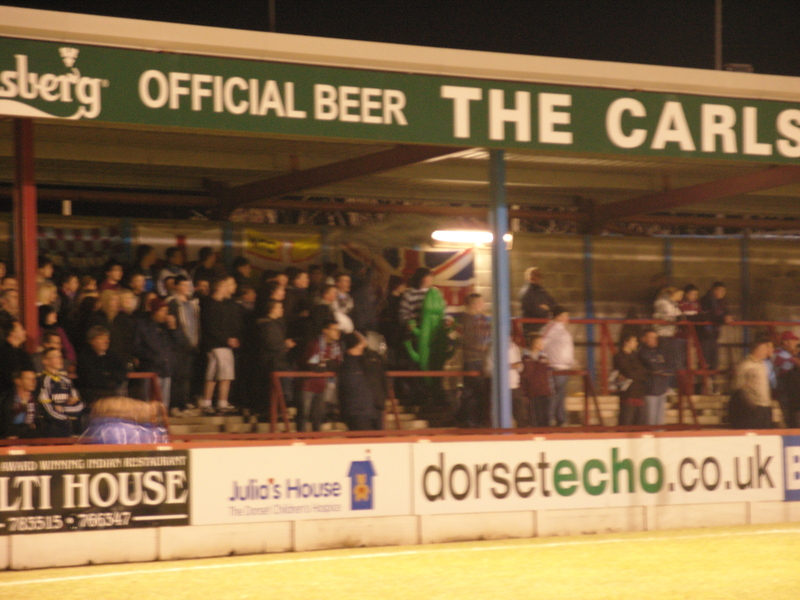 But there is a club that could make the TV show for both – Weymouth FC. The last few years have seen so much drama going on in this small naval-influenced town in Dorset that they could make a TV programme about the club – in fact they actually did some years ago! Events in the past few months would make avid viewing for many people trying to understand what is wrong with football at the moment. The club hit the national footballing headlines in February for the wrong reasons as due to ongoing financial issues, the club could not insure thier first team players for the home game versus Rushden and Diamonds, and so the youth team had to take their place, losing 9-0 in the process. There was some headlines about “betting scandals” around the game, but if you heard your club had to field eleven teenagers with no experience it doesn’t take a rocket scientist to work out that they may get a battering! It would be remiss of me not to include a potted history of the club before moving on to more interesting aspects. 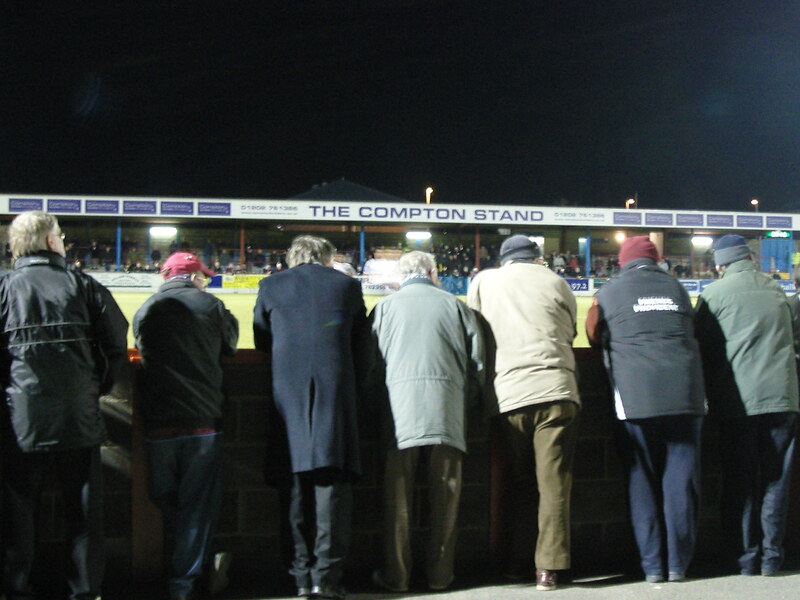 Whilst the club were formed in 1890 they did not start to make an impact on the Non-League scene for many years. In 1998 the club finally got out of the Southern League Southern Division after many years of trying. During the next few seasons a number of managers came and went, unable to push the club into the top level of the pyramid. These included Neil Webb and latterly Steve Claridge who as Player Manager set the club on their way to promotion from the Southern League at the end of the 2004 season. In their second season in the newly formed Conference South the club won the division from St Albans, who were also promoted after the play offs. Whilst progress on the pitch was impressive, off the pitch things were not going to plan. A number of owners came and went promising great things for the club and changing the manager with the seasons of the year. Since promotion to the Conference they have had four managers, including ex-Chelsea legend John Hollins. The club finished 11th in their first season at the top level, slipping down to 18th last season and enduring a few bitten finger nails in the process as they looked over their shoulder at the trap door. Some may say that relegation would have been a blessing for the club in some ways as it would have put less financial pressure on the club. This season the club has run into dire financial problems which many have blamed at the door of former chairman Malcolm Curtis. With seemingly all financial options exhausted and a £300,000 debt around the neck of the club and no first team players available it appeared that the club may simply go out of existence by the end of the season. However, hope has raised its head as a local businessman appears to have agreed to pay off the debt and provide funding to allow the club to continue. Going into the game with Salisbury the club had gained 42 points, some 9 points above the trap door, and with a host of other teams below they probably have enough to survive the relegation fight, although since the financial problems escalated in early February they had lost four games on the bounce so it was important that this run was halted. Salisbury had also had a tough season, sitting one place and four points below Weymouth and with a few financial issues of their own. Since Christmas they had drawn too many games and came into the game firmly in the relegation mix. I eventually found the stadium on the outskirts of the town centre, far away from any amenities or comforts. After parking the car (£2 – very reasonable) I went into the stadium to soak up the atmosphere. Now I knew that Weymouth had a few issues in getting a team out but I did not expect them to be fielding a team of teenage girls…They were all ready for action by the tunnel and for a few minutes I thought this may be more interesting than I had initially thought. Alas they were just the ball girls, but you had to feel sorry for them as it was a chilly night and they were not exactly dressed for the part. The more voricifous home fans had taken up residence in the Carlsberg Stand – complete with an array of inflatables including a number of beach balls, dolphins and rubber rings – all standard issue for the Blue Square obviously. The Beachball was soon confiscated as it made its way onto the pitch on one too often an occasion. As the teams lined up it was obvious which of the Weymouth team were “newbies”….firstly they looked about 12 and secondly they had not yet got their names on the shirts. In fact 6 of the starting 11 were in this position. So the game kicked off with yours truly listening to Liverpool versus Real Madrid on my iPod. In fact for the first thirty seconds the commentry seemed to be coming from the Wessex Stadium as play was synchronised in my ears. Then Salisbury hoofed it long, a slight touch on the keeper and the resultant goal was disallowed – and that is where the similarity to Anfield would end (or so we thought). The first twenty minutes were high on energy and endeavour but low on quality. 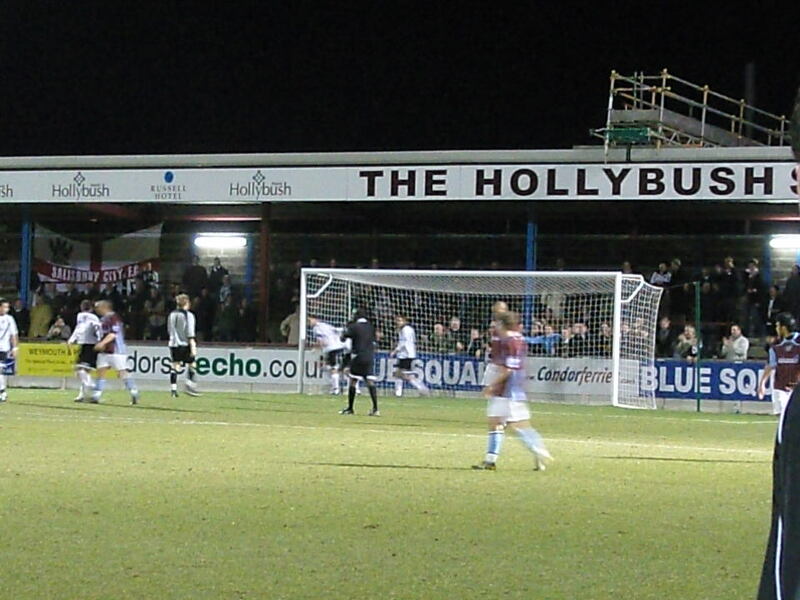 The Weymouth team resembled a newly promoted Sunday League team – lots of energy and tricky pacey players but no cutting edge, so it was no surprise when Salisbury eventually took the lead from a corner that was bundled in by centre back Chris Todd after the defence had failed to clear the ball. The game was essentially over a few minutes later when in his youthful exuberance Weymouth’s Stephen Reed went in late on Luke Ruddick and after a bit of handbags which required the intervention of all four officials the home striker was sent off. I took the opportunity during the break to have a wander around the ground. The stadium is just over twenty years old and is really showing its age, none more so than what is visible in a visit to the gents toilets that reminded me of the film Midnight Express. There are far too many crush barriers on the terraces, making wandering very difficult, and especially as there has only been one occasion when they have been needed in the last twenty years. There is also a strange section of the ground for disabled spectators that is essentially an extended dugout covered in netting, confusing the fourth official as to who he should be patrolling! The second half saw Weymouth make a change up front but it was Salisbury who soon doubled their lead as another corner was poorly cleared and Tubbs drove home to make it 2-0. If Weymouth had any hope of getting a point all hope faded a few minutes later as Charlie Griffin scored the goal of the game, curling in a shot from the edge of the box. A final Darrell Clarke goal in the last fifteen minutes completed the scoring and let the home fans ruing the fact that they were now well and truly in a relegation fight. Just before the match the fans had been given an update on the promised £300,000 cash injection. The loaner, a Mr Beer only wanted to see the club financially straight – he wasn’t interested in any long term commitment, place on the board or a say in how the club was run. A strange relationship if ever there was one, but apparently his Christian beliefs determined why he should help the club. So it appears the club is safe for now, although a massive effort must now go into ensuring their survival. Whilst Alan Green may not have been describing the finer points of play at the Wessex, he did at least get the score line to match from Anfield.